Three men seen standing on the roof of a building shortly before it was engulfed and destroyed by fire have been identified by police. 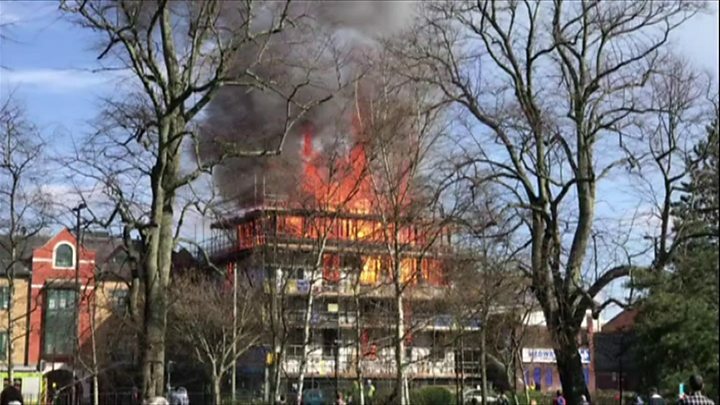 The blaze broke out in the building which was under construction in St Mary Street at about 14:00 GMT on Tuesday. An image of the men police wanted to find to "make sure they were OK" was later released by Hampshire Constabulary. The force said no arrests had been made and the cause of the fire was unknown. The fire which started on the fourth floor of the building was put out on Tuesday night - but fire crews remain at the scene damping down. The entire timber-framed property between St Mary's Place and St Mary Street was destroyed in the fire. Police said the building was vacant and there were no reports of anyone being injured in the fire. More than 70 firefighters tackled the blaze which saw residents of a neighbouring block of flats evacuated. Some residents unable to return home due to fire damage have been offered accommodation by Southampton City Council, police said. Police have appealed for witnesses and anyone with video footage to come forward.